The Sports documentary chronicling the meteoric rise of the Irish MMA Star grossed a weekend total of €103,000 after making its world premiere in Dublin last Wednesday, November 1st. The premiere was followed by a live Q&A on 235 screens across the UK and Ireland where it took the #2 spot in the Irish theatrical chart, and #6 spot at the UK. “The entire production team are delighted with the initial opening success for ‘Notorious’ and hope audiences are enjoying it. In four years, Conor has gone from ambitious young fighter to global icon and it was a huge privilege to document his rise to superstardom. 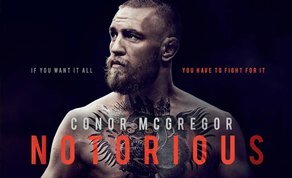 “Over the coming days the film is opening across the US, Canada, Australia and New Zealand which I suppose is a measure of just how far Conor McGregor has come. Directed by Gavin Fitzgerald (The Fighting Irish) & produced by Jamie D’Alton (I Am Immigrant) the film is set for a worldwide theatrical release. Producer on the film was Graeme McDonnell (The Notorious) and executive producer for Motive Films was Anne McLoughlin (Between Land & Sea). The film was edited by Andrew Hearne (Unbreakable) and scored by Hugh Drumm (A Date for Mad Mary). Darragh McCarthy was DOP on the project and associate producers were Patrick Timmons Ward and Eoghan Liston. Post production took place at Outer Limits, Dun Laoghaire with Garry Curran (Room) colourist and Ciara Walsh post production supervisor. The film was mixed by Aza Hand at Egg Post Production.